I couldn’t find a recipe for the style of flag I wanted, so I kind of made one up. 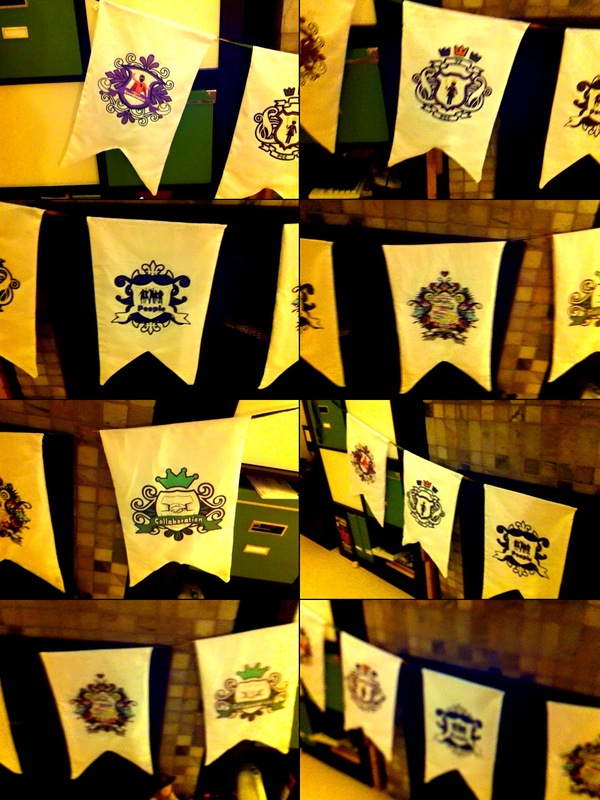 They’re not perfect – neither my sewing skills nor my crest-making skills are really existent at all, but they’ll pass. It helps that they’ll be hung from the ceiling, so no one can really look too closely. I’m kind of proud of them, flaws and all – I sewed a thing! Five things! And I only swore at the sewing machine 9 times, and needed Josh to help me fix it 4 times! Craftiness is AWESOME! I don’t feel very good, though. I had to skip brunch this morning for feeling like hell, and I’m kind of queasy. I’m not allowed to be sick, so I have until tomorrow around 7am to get better. So, here we go. hope you are feeling better. these are awesome.